Throngs of people streamed into the Capitol Rotunda yesterday to spend a moment before the flag-draped casket of President George H. W. Bush. Among them was Sen. Bob Dole. 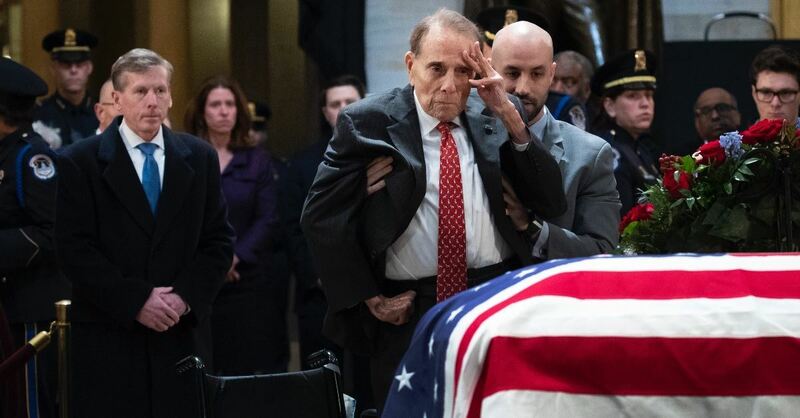 While serving in the Army during World War II, Dole was badly wounded by German machine gun fire. He never regained use of his right arm; his left arm is minimally functional. Nonetheless, he went on to serve Kansas in Congress from 1961 to 1996 and run for president in 1996 as the Republican nominee. Now ninety-five years old, he is confined to a wheelchair. But he wanted to pay his respects to President Bush, so aides helped him stand. He then used his left hand to salute the casket. It was one hero saluting another. I hope you’ll watch the now-viral video. Today has been designated a day of mourning for President George H. W. Bush. His remains are lying in state at the US Capitol this morning. His son, President George W. Bush, will deliver the eulogy at Washington National Cathedral later today. Many are mourning the passing not just of a great man but also of the civility he represented. Consider one example of his gracious spirit. In 1989, President Reagan left a humorous note for his successor in the drawer of his Oval Office desk. In 1993, after a bitterly fought presidential campaign, President Bush left a letter in the desk for the man who defeated him, cementing a tradition that has continued to this day. “Your success is now our country’s success. I am rooting hard for you. Consider another example of President Bush’s kindness and humility. Before the collapse of the Soviet Union, he invited Mikhail Gorbachev to Camp David. Driving the presidential golf cart, he took the Soviet leader to one of his favorite spots, the horseshoe pit. Bush asked Gorbachev if he had ever played horseshoes. Gorbachev said he had not. Bush suggested a game. Gorbachev agreed and got a ringer on his first throw. Bush had the horseshoe mounted on a plaque, which he gave to Gorbachev at dinner that night. It seems everyone who worked with Mr. Bush had a story about his gracious spirit. The president was not just being himself–he was modeling the change he wanted to see in the nation he led. One of the ways I believe God wants to redeem the passing of George Herbert Walker Bush is by calling us to follow his example. We live in a day dominated by geopolitical conflicts and economic uncertainty (as yesterday’s stock market plunge shows). Brexit is dividing Great Britain from Europe and Brits from each other. The European Union is more divided than at any time in its fifteen-year history. Muslims are split into Sunni and Shia. Russia threatens Eastern Europe and China is ascendant. Big problems seem to call for big solutions. It is tempting to think that we cannot change anything unless we can change everything. But the opposite is actually true. The most significant way to change the world is to help someone in need: “If you pour yourself out for the hungry and satisfy the desire of the afflicted, then shall your light rise in the darkness and your gloom be as the noonday” (Isaiah 58:10). That’s because the only things in this world that are eternal are not things. When we serve others, we emulate the One who “came not to be served but to serve” (Mark 10:45). And we love our Father by loving our neighbor (Matthew 22:37-39; 25:35-40). Will you make this purpose yours today? NOTE: Please join me today for a live Q&A on Facebook Live at 12 p.m. CST. I will take questions and discuss the latest headlines. Click here to visit our Facebook page. See you there!